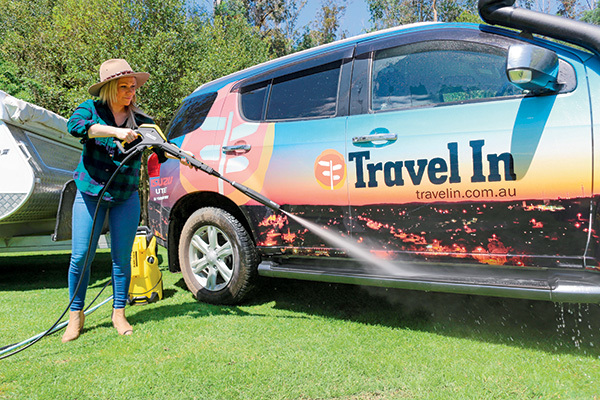 Let’s face it, no matter how hard you try to keep it clean, your caravan and tow vehicle will need some TLC at the end of the trip. Gravel tracks, outback highways and even smooth, paved roads can leave your pride and joy covered in thick layers of mud and grime. Have you ever tried cleaning around your wheel arches and the front stoneguard with a garden hose alone? If so, you’ll know that high water pressure makes the job much quicker and easier. Enter the Karcher range of high pressure washers. 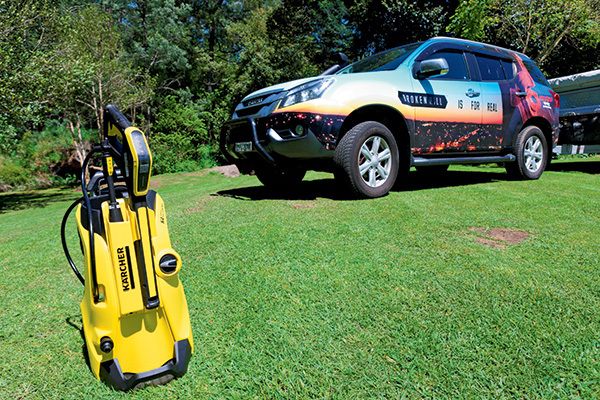 The K4 Premium Full Control Home, (‘Home’ meaning the kit includes an attachment for cleaning driveways, pavers, decks and such), also comes with the so-called Vario Spray Lance, which allows the water pressure to be adjusted with a simple turn of the nozzle, from low pressure for applying detergent, to high pressure. Weighing 11.95kg, it’s reasonably portable, with a telescopic handle included. The special hose guidance system minimises tangles and reduces the chance of the machine being tipped over when the hose is pulled. The hose reel on the back of the washer helps, too. Some assembly is required but it’s nothing that can’t be achieved with 10 minutes and a Phillips head screwdriver. Other features include a brushless, water-cooled induction motor, a pre-installed water filter to protect the pump from dirt particles, the ‘Plug and Clean’ detergent system, a five-year warranty, and maximum pressure output of 1900psi (7L of water per minute). It can even draw water directly from any available water source, such as a river, so mains pressure isn’t required.